"Cook with your heart, because cooking is celebration and food is love"
I know this recipe seems a bit labor-intensive, but it is well worth it when you want to impress your dinner guests with something spectacular. It is a definite crowd pleaser. The thing to remember is not to let working with the filo pastry intimidate you. Just stay calm and give your self lots of time for the project. I assemble the pochettes a couple of hours ahead and pop them in the oven just 10 minutes before guests arrive, keeping them warm in the turned-off oven if necessary. Remove the filo from the refrigerator 30 minutes before starting. Slice the tomatoes lengthwise and scoop out the seeds with a spoon. Squeeze gently to eliminate excess liquid. It’s important to get the tomatoes as dry as possible. Wipe dry, inside and out, with a paper towel. When the tomatoes are dry, dice them. In a bowl, combine the tomatoes, feta, basil, and crushed red pepper to form a salad. Add a pinch of salt only if needed. Prepare the filo dough by laying out a clean dishcloth on a flat surface. Make sure both surface and cloth are large enough to accommodate the flat filo. Stack the filo on the cloth, and cover with another dishcloth. With hot water, dampen and wring out a third cloth and lay that flat over the top cloth. Cut the filo stack carefully—with kitchen scissors, as knives tend to tear the pastry—into 8-inch squares. Remove 3 squares of the filo at a time, keeping the rest under the towels. Take 1 sheet and brush it with the clarified butter. Place a second sheet of the filo at a 45° angle over the first, and brush this with butter as well. Place the third sheet of filo at a 45° angle over the second, and brush this with the clarified butter. 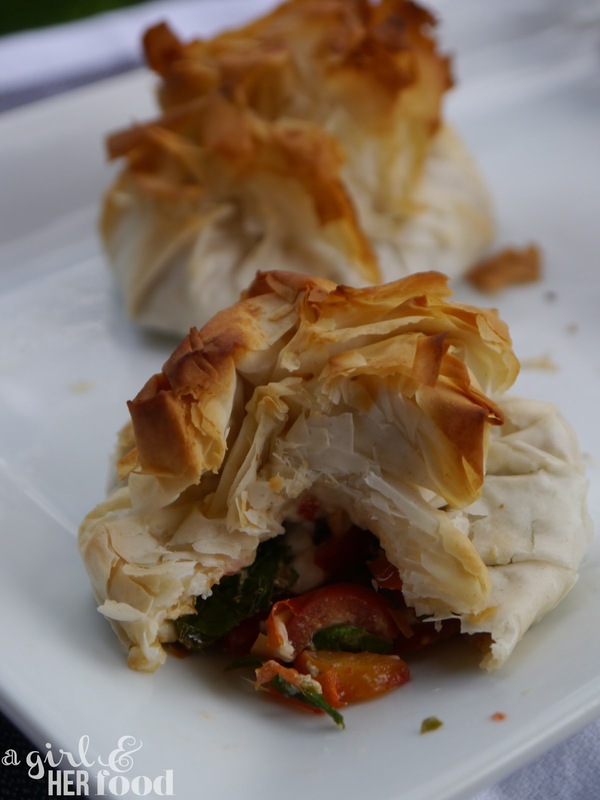 Now spoon 1 to 2 tablespoons of the tomato salad onto the center of the filo. Gather together the corners of the filo and twist the packet ends gently, as you would the ends of a hard-candy wrapper. Fan out the ends into a rose floret. Then peel down the petals to fan out a nice crown. Brush the top of the pochette with more clarified butter. Repeat this process until you have about 10. Place the pochettes on a baking sheet in the preheated oven for 10 to 12 minutes, until the sides are golden brown. Serve warm. From the look of it, I'd give it 4 forks!